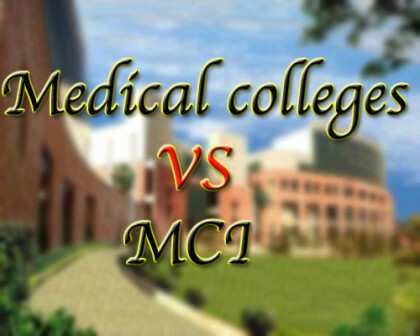 The hon’ble Supreme Court yesterday considered a batch of petitions filed against MCI and central government over inspections and slammed both the MCI and the Central government for having delay in inspections. In a case titled Royal Medical Trust (Regd) and Anothers vs Union of India and Anothers, the Supreme Court considered a batch of petitions that arose out of communications issued by the Central Government recommending disapproval of applications preferred in respect of Medical Colleges of the applicants for the academic year 2014-2015. In these petitions, after conducting inspection of the respective Medical Colleges the Medical Council of India (MCI for short) had found infirmities or inadequacies in the infrastructure, facilities and faculty. The respective applicants then claimed that they had rectified the shortcomings and asked for compliance verification. But the Central Government and/or the MCI refused to undertake any fresh inspection for verification, for want of adequate time. Considering all the points raised by both the parties, the bench of Justices A R Dave, Vikramjit Sen and U U Lalit said “The MCI and the Central Government have been vested with monitoring powers under Section 10A and the Regulations. It is expected of these authorities to discharge their functions well within the statutory confines as well as in conformity with the Schedule to the Regulations. If there is inaction on their part or non-observance of the time Schedule, it is bound to have adverse effect on all concerned,” the Court said. The court however said that the requirements of reasonable opportunity must be afforded not only at the initial stage but also in cases of subsequent renewal and further that the opportunity must be afforded at both the stages namely by the MCI as well as by the Central Government, the Schedule under the Regulations must accommodate and provide for adequate time limits to take care of such eventualities.